Powered with Android 8.1 OS, Unlocked for hundreds of Apps and games available on Playstore. Perfect for home entertainment, home theater, business meeting, etc. The Enfonie MX10 TV Box featured with the Rockchip RK3328 Quad Core CPU, frequency up to 2GHz; 4GB DDR4 RAM and 32GB eMMC storage; Enjoy ultra fast operating experience. With the Fast Internet connection you can easily steaming multi media to your TV without buffering. The Professional H265 video decoding technology offering more stable to enjoy a higher quality video experience. 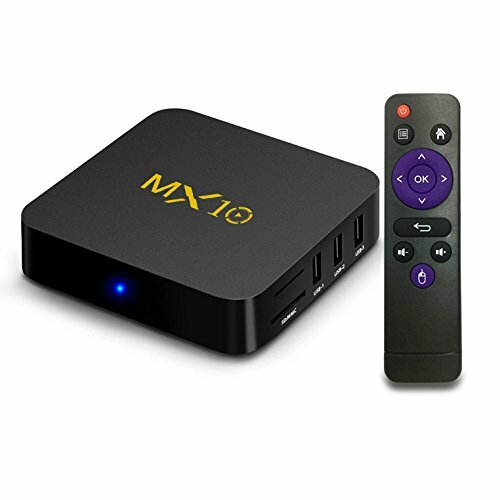 The Enfonie MX10 TV Box Support 4Kx2K Full HD video decoding, with the HDR which supported by Android 8.1, you can enjoy wonderful movie watching experience. The Box featured with 4 USB Port[ 1 USB 3.0 and 3x USB 2.0], support U Disk and USB HDD; SD Card Slot support up to 64GB storage extension; You can easily connect to an Air mouse, keyboard, game controllers, etc. An IR remote is included in accessories.